I hadn't intended on doing an interim update on how I'm getting on with my treatment, my plan with blogging the process was to update on a monthly basis on how I've been getting on that month. 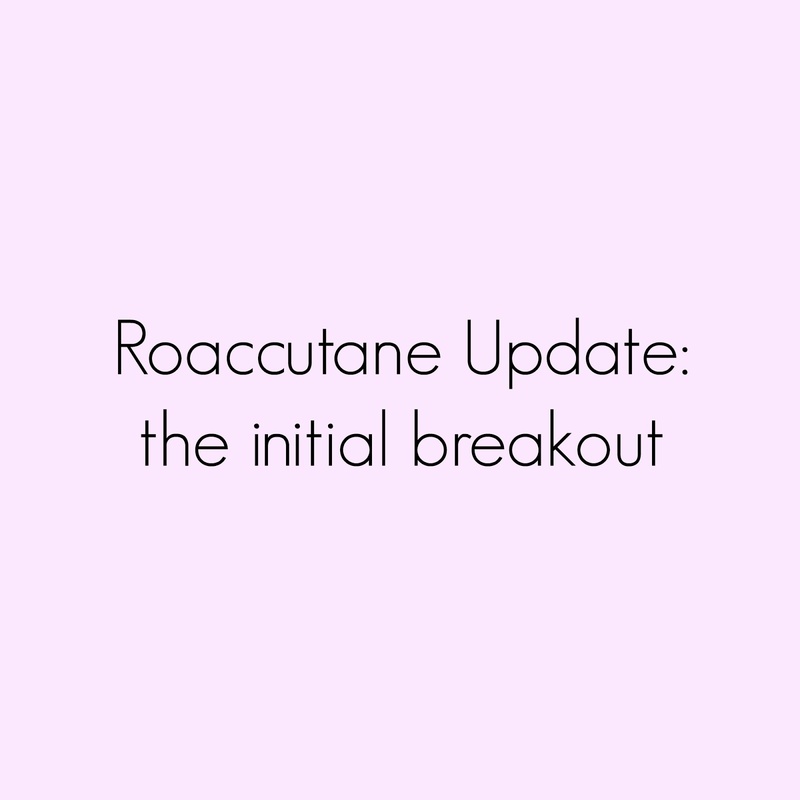 However, I felt compelled to update on my experience with the dreaded initial breakout or purge that people who take this drug talk about. As of yesterday I'm three weeks into my treatment and it hasn't been plain sailing. The first time I took Roaccutane I didn't experience a purge, this time I think my skin is making up for it. Despite the breakout that prompted my dermatologist to put me on the drug calming down within days (probably due to the steroids) going into week two my chin exploded. It was incredibly painful and covered in lots of under the skin spots, I was waking up with fresh spots coming up every morning. The middle of week three saw me head off to do my first aid refresher course on what I believed to be the worst day of this initial breakout. There’s nothing like being in a room with a bunch of strangers having to perform CPR on a dummy with the fear of a) having to put my chin close to the dummy and potentially knocking my skin, which would be painful, along with the risk of my make up rubbing off and b) knowing the dummy had been rubbed down with a wipe that probably wouldn't do my skin much good was genuinely awful. Following the CPR practice we had to buddy up and perform the recovery position on each other, it was at this point that I honestly felt like walking out of the training. When you’re experiencing such bad skin as I am you don’t even want to go out in public, let alone have a total stranger look down on your face from above. I felt low, really, really low. It was this week that I also started developing slightly larger under the skin spots as well as the smaller ones. My bottom lip also really dried out, I’m currently rotating three different lip balms, I'm planning on doing a post on what products I've been using so I'll save the detail for that. Day 19 was a stand-out day. I was spending the weekend in Bristol and as soon as I woke up I knew things were bad without needing to look in the mirror. It was probably the lowest point in my treatment so far. After getting out of bed and looking at myself in the mirror I just wanted to get in my car and drive home to hide away in my house. Instead, I went down to the kitchen and cried. Telling myself that this will all be over soon is pretty much the only thing getting me through it, it's not been an easy few weeks and at the moment it doesn't seem like it's going to get better any time soon. I have weekends away coming up and I would so love to have cleared up by then, the almost constant obsessing over my skin is wearing thin. Oh man, I send my sympathies. I do not miss those days of intense breakouts where it pretty much hurts just to be awake and breathing. I've heard great things about sticking through it, so hopefully it takes hold soon and gets you the skin you're looking for. You'll get there since you're so determined. Once you get truly fed up, you'll do what you need to do. I'm not sure if my transition was either a result of just getting older and my hormones shifting (again) or that I got my digestion in order with a naturopath. I went to see her about the acne, and she worked on my digestion (which was a mess) and also commented that I was eating a lot of fruit (natural sugars and all that). I backed off the fruit, now take a strong dose of Vitamin A and probiotic daily, and have some Chinese herbs if my digestion goes out of wack again. It has helped tremendously. I was taking it for a few months before I last saw you but didn't ever experience anything like this. Bad times. I've gone down the supplement/probiotic/limiting dairy thing but unfortunately I think I'm one of the unlucky ones who is stuck with rubbish skin unless I do something drastic like Roaccutane.